The Farmer List visible in the Moderator Controls window shows all of the players currently in the game. The list also allows the moderator to 1) remove players from the game and 2.) adjust the goals of individual "bot" players. Instructions for doing each are described below. 1. Check the box next to the name of the player(s) you want to remove from the game. 2. Click the remove button at the bottom of the player list. Confirm that you want to remove the player in the next pop-up window. 1. Check the box next to the name of the player whose goal you would like to change. 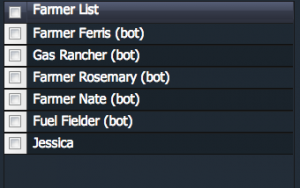 Note: You can only edit one bot player at a time. 2. Click the "Assign Strategy" button below the list of players. 3. 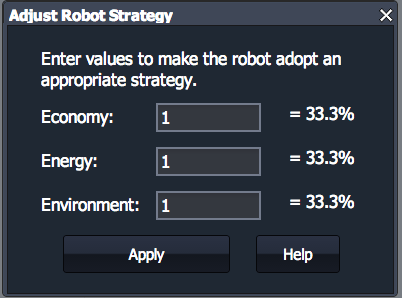 In the pop-up window, enter how much weighting you want the bot to give to economy, energy and environment scores. As you enter values for the weighting, this will be automatically converted to a percentage. 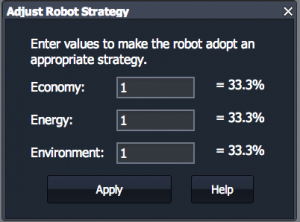 For example, if you wanted the bot only to maximize its environmental score and ignore the energy and economic components, the you could enter a "1" for environment and a "0" for the other two categories.